There are many stories of victims and their families who, unfortunately, have had reason to question the legal system in Scotland. Those who feel the system is set up with the rights of the accused favoured, those who feel victims and their families have been ignored and those who feel they have nowhere to turn to for help. Victimsvoice4scotland aims to help those people. You. Your family. We feel strongly there needs to be a Victims Commissioner for Scotland. Someone who can works for the victims and who can help their families deal with the many issues that arise when a loved one becomes a victim of a crime. We need someone who can help deal with the Judiciary and a legal system that can be confusing and terrifying. A system that so often fails them in their hour of need. While there are excellent support groups out there who can help you with the emotional impact of losing a loved one to a crime or being the victim of a crime yourself there is no-one who can help fight for change within a system that has clearly left many victims and families lost, angry and bemused at the lack of transparency and accountability. This is our story and the reasons for our campaign. Let us tell your story. Let us fight for the victims. Together we are stronger. Together we can make a difference. Our first issue came while we were at the hospital with Shaun. We had noticed on that first night a police officer in the room with us, sitting at back. She was respectful and unobtrusive but she was still there. I asked why and she explained that because Shaun was technically classed as 'dead' he was also 'evidence' and an officer had to be present until it was time for Shaun to be handed over to the pathologist. This was difficult to process. What did they think we were going to do? Tampering with 'evidence' was not how we saw our son. Surely there is a better way to deal with these types of circumstances or even have the process explained when the knowledge is there someone is dying? It took all of three days for our next issue to arise. The family liasion officers, from Police Scotland, were excellent. On this day they asked to speak to Shaun's mum, Denise, and myself as next of kin. They required us to go to the mortuary and formally identify Shaun. I found this strange as we had all been at the hospital together and Shaun was going into surgery for organ donation but we still needed to go through this traumatic process so a box could be ticked. 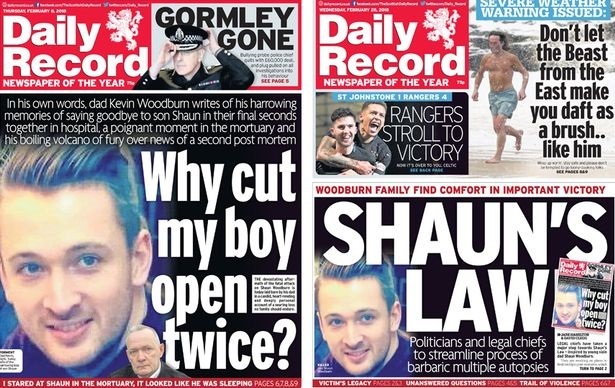 They knew it was Shaun Woodburn who had died. Is this formality really neccessary given the circumstances? I went to the mortuary the next morning and this was probably the most difficult moment of my life - identifying my son in the city mortuary. I have to say that the staff had done a fantastic job in getting Shaun to look perfect in every way even to the point of brushing his hair in exactly the right way. His colouring, especially his cheeks, made it look like he was just asleep. But of course he wasn't. I will never forget how he looked at that point and I am extremely grateful to all of the staff involved. They gave me, a grieving father, that memory, a final moment with my son with no tubes, no machines, just Shaun looking his usual handsome self. 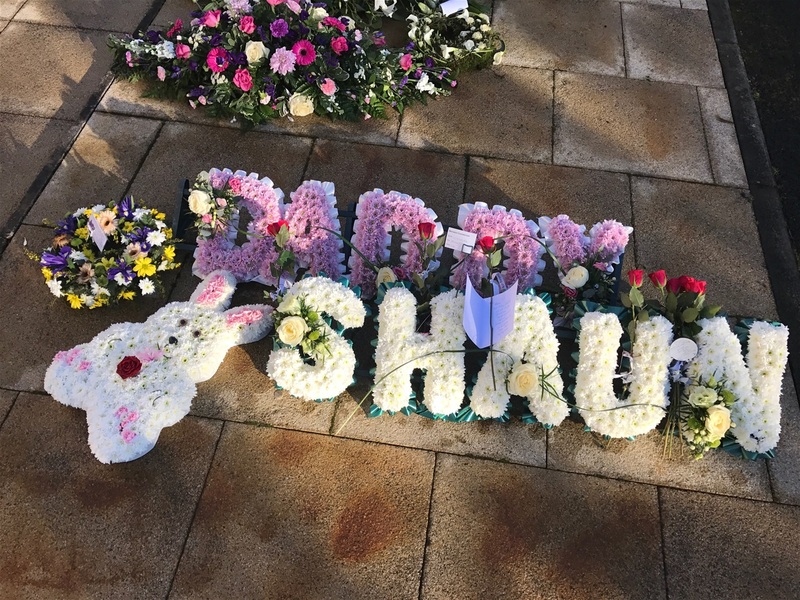 I asked the officers when we could expect to have Shaun returned to us to arrange the funeral, what came next made me more angry than I had been at any point in the last few days. It was explained to me that they couldn't give me a time frame as it depended on when the defence would carry out their Post Mortem. I was horrified, what did they mean the defence PM, why did the defence require another PM, the first one hadn't even been done yet and I'm being told that the defence had the right to open up my son again to another PM. Why, on what grounds, could this possibly be happening? None of that mattered it seemed, Shaun would have to go through this as that was just the way it is. I couldn't accept this, not only is it barbaric, its downright medieval. We live in a society that lets this happen, surely there has to be a better way, surely in 2018 we can have a system that allows for both the defence and the Crown pathologists to be present at the same PM. There weren't even any medical grounds for this, just the perpetrator's right. I later found out that under Scots Law each defendant has the same right, in Shaun's case there were 3 that had been charged, which could have meant FOUR separate post mortems which is horrific to say the least. The Crown assured me that it never happens, but with everything I have discovered since with the COPFS, I have my doubts. It is time for Nicola Sturgeon and the Justice Secretary Humza Yousef to abolish this barbaric system and find a better way. These brushes with an unfair system came before we had even buried our son, we didnt have Shaun returned to us until the 18th of January - 17 days after he was killed. 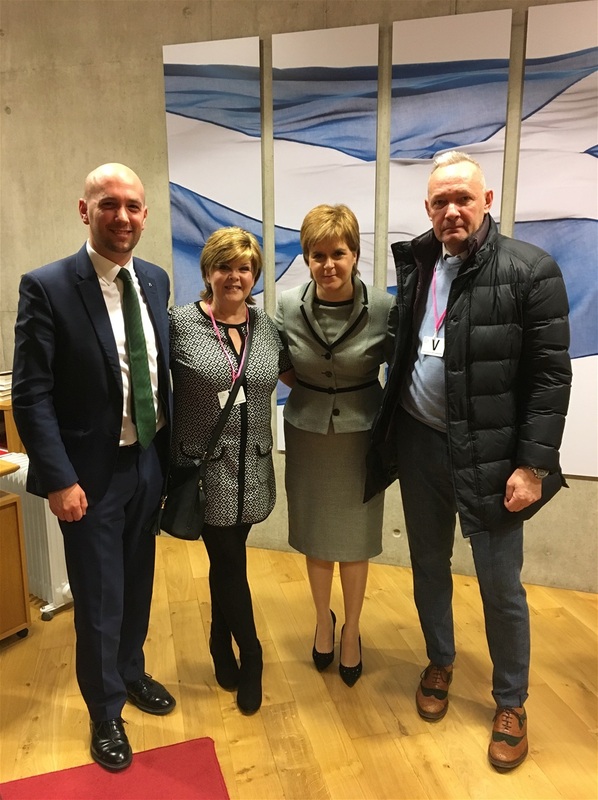 Since that time our family has met with the First Minister Nicola Sturgeon and the then Justice Secretary Michael Matheson, along with Ben McPherson our local MSP. Labour MSP Kezia Dugdale has also been instrumental in supporting our view that the post mortem laws need to be changed. After Kezia's questions in Parliament we were delighted to hear that Michael Matheson would investigate the situation and look at reviewing the post mortem laws. Recently it was announced that following a review of the procedure protocol changes are coming into force which will streamline the process for families and ensure their relatives are returned to them much quicker. Lord Wolffe the Lord Advocate recently wrote to Kezia and the changes to the protocols for Post Mortems have since been put into place with the agreement of all parties involved.This has been quite a breakthrough in a very short period of time and we are delighted to say that this is now effectively " Shauns Law " in place . 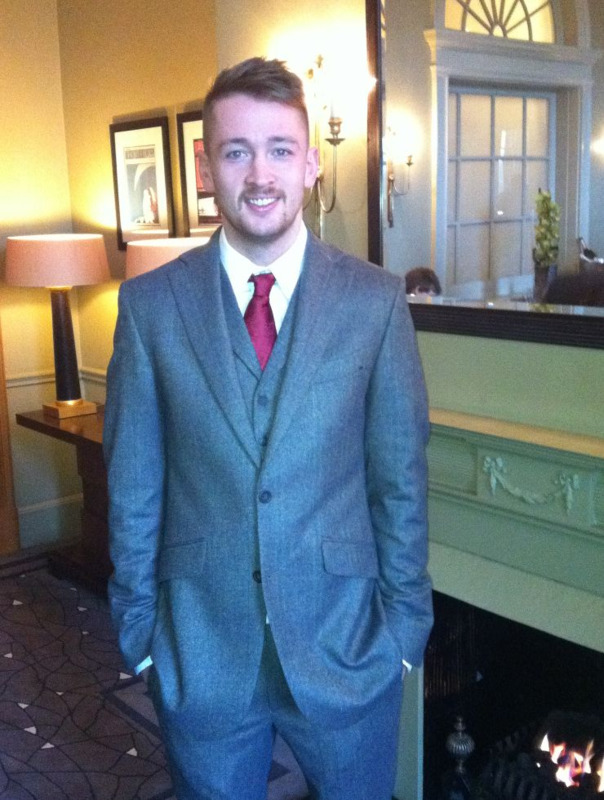 It is too late for Shaun but if we can change the system for just one more family then his death will not be in vain, and for us this change is a legacy going forward for our son. Nicola Sturgeon with Ben McPherson and Shaun's parents Denise and Kevin. The system and our issues with it. Where do i begin, there are so many. 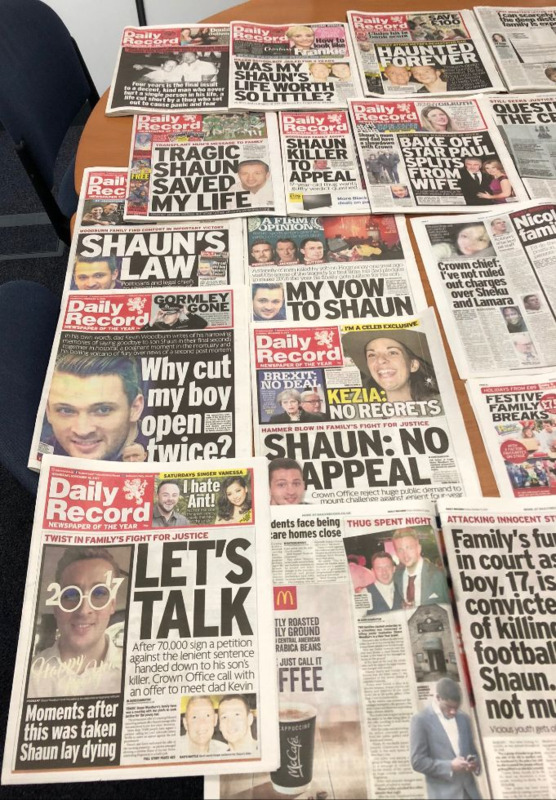 I will try to summarise the main points in Shaun's case, but I will add links to some of the press articles that have been written throughout the last 2 years, hopefully they will give some of the detail to you. There is no accountability, no transparency, and probably hardest to take of all, the entire system is built around the rights of the accused, and not the victims. The judge in Shaun's case was Lady Stacey, she passed the sentence on Ibnomer of 4 years, plus an 18 month supervision order. This was whats called a cummulo sentence, or a total combined sentence for all of his crimes, he pled guilty to Assault and Serious assault, he was found guilty of Culpable Homicide. For all of his crimes. To this day nobody, including Lady Stacey will tell me what sentence was passed for killing my son. Lady stacey is the only person who can break it down, but she refuses to do so. The Scottish Sentencing Council, formed in 2015 with an initial remit of producing guidelines for both Murder and Culpable Homicide in Scotland. 3 years later, and nothing, no guidelines for the 2 most serious crimes, and nothing even remotely on the horizon, all of this at the tax payers expense. Why are these guidelines not alraedy in place, perhaps because the Judiciary doesn't want them in place, after all why should they be told what sentences that they should pass down. The Lord Advocate is the only person in Scotland who can appeal a sentence that has been passed in Scotland. This MUST be done within 28 days of the sentence being passed. However if a defendant wants to appeal a sentence, their legal team has 8 WEEKS to intimate that they want to, and then take as long as they want to bring it back to appeal. Where is the fairness in that system. The Lord Advocate, Lord Wollfe, must decide wether or not a sentence passed is " unduly lenient", not just lenient, but unduly so. What exactly does that mean, and why should it be one person that decides this. In Shaun's case we launched a petition in the hope that it would put pressure on Lord Wollfe to look into the sentence passed, with almost 70,000 signatures, it worked, he agreed to look at the sentence. After 28 days he decided it was NOT unduly lenient. However when asked on numerous occasions by myself, the COPFS are unable to tell me what sentence was passed on Ibnomer for the killing of our son, they CAN'T tell me the sentence just for that part, but they CAN say that it was not unduly lenient. Where is the logic in this fact, something that has been admitted by Crown Counsel Alex Prentice QC at subsequent meetings. The entire trial that lasted some 18 days was frought with issues, witnesses not called, no testimony heard on the weapons that were used by defendants, the whole trial was in our opinion totally mis handled. Having met with Crown Counsel Alex Prentice QC on two ocassions now face to face, I still find that there are glaring holes in the entire trial. We felt that we had a good prosecutor in Tim Niven Smith, however what we did not know at the time of the trial, he was already under investigation for his handling of a previous trial for the mis representation of evidence at that trial. Three judges decided that he had in fact "misrepresented evidence" and the accused in that particular trial was retried. I asked Alex Prentice on numerous occassions if he was happy with the way that Tim Niven Smith handled the trial, he said he was. However he has still been unable to answer some of our questions, a year now since the trial was concluded. After being found guilty of misrepresentation, Tim Niven Smith resigned for the COPFS, to my knowledge the last case he tried was Shaun's. He went on to head up the Clutha Enquiry, and this was the point he resigned, as a matter of honour is how it has been described. I asked Alex Prentice for a face to face meeting with Tim Niven Smith, but my request was denied. These are but some of our issues, and at this date it's over a year since the trial ended, and we still have many un-answered questions. Our Judicial system is a law unto itself, no accountability other than to itself, no transparency whatsoever, and no guidelines on sentencing, only a Judge will decide a sentence passed , and does not have to justify that decision to anyone. They DO NOT HAVE TO BREAK A SENTENCE DOWN, NOR EXPLAIN THE PRECEDENTS OR PREVIOUS CASES USED TO DETERMINE A SENTENCE, how can this be right in todays open and transparent society. It is one of the last bastions of secrecy we have in our country, and its without doubt a system that needs to be more open, and more transparent to the public at large, after all we are the ones who fund it all.